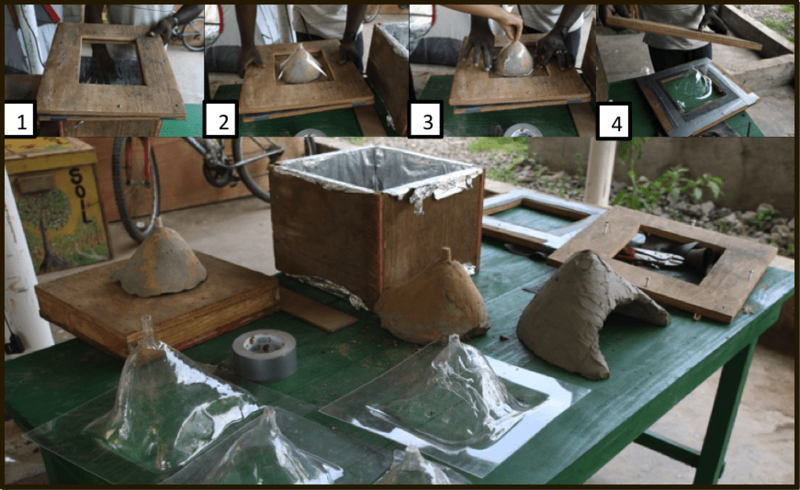 The development of SOIL’s household urine diversion toilet, aka the EkoLakay toilet, has been an iterative process. We thought that it would be great to share that history with you: EcoSan lovers, SOIL fans, and toilet developers around the world! A good toilet design should take into account cultural practices and habits and should be ergonomic, durable, practical and last, but not least, aesthetically pleasing. SOIL’s household toilet made its debut in 2009 as part of a project in collaboration with Oxfam Great Britain. The goal of this project was to design a small and portable ecological toilet that could fit in very small urban households and which would allow for easy removal of urine and feces. The first toilets were designed using a urine diversion mold imported from Mexico and were made using local clay. Our very first toilet of this model is still in use to this day at the SOIL farm and if you have a chance to visit you can experience this piece of SOIL history first hand! When the earthquake happened in 2010 the household toilet project was temporarily put on hold as the team focused on emergency response. In 2011 the project recommenced with the second household toilet model made from plywood. It included a container on the side for storing cover material and a side door for cleaning and access to the pee gallon and poop bucket. The toilet seat was made out of sturdy fiberglass and included a urinal. This toilet was installed in a few households in Shada II, Cap-Haitien in 2012. The next household toilet model was developed in 2012 in collaboration with re.source (a team of Stanford researchers led by of Kory Russel and Sebastien Tilmans). This toilet went through many many iterations as part of an intensive user-centric design process. It was constructed locally, using materials bought in local markets and hardware stores. The toilet had an internal frame constructed from wood that was covered by a masonite and formica laminate. 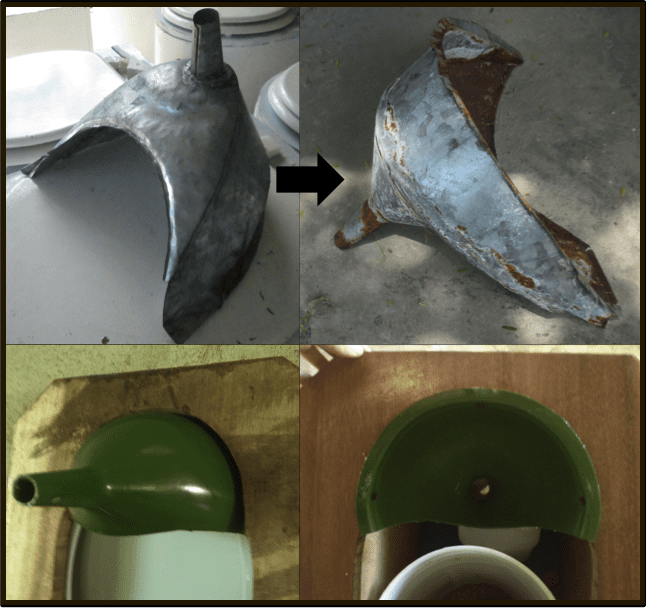 The urinal was made in the USA by the Stanford team out of plastic, but the Stanford team subsequently worked with SOIL to set up a local plastic molding process (see below). In the urinal, a simple gauge system was made out of a ping-pong ball and a straw to give an indication of the level of pee in the gallon. When the pee gallon is full, the ping-pong ball would ascend and be visible to the user. The toilet had a side door for cleaning and access to the poop bucket and pee gallon. 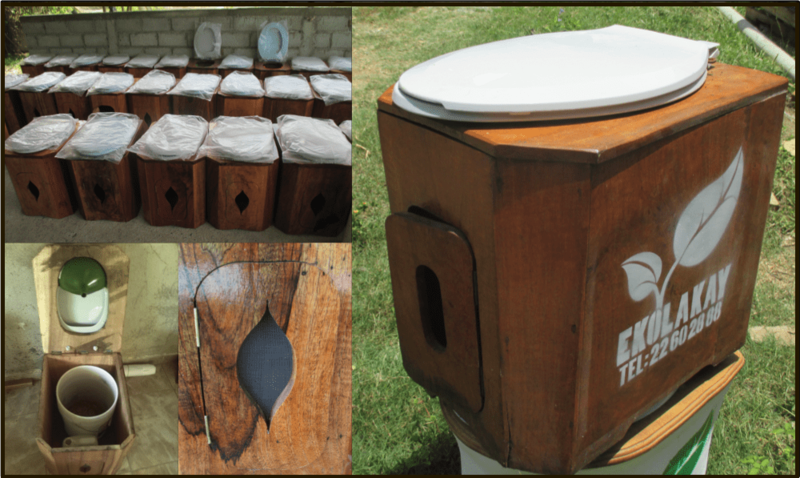 This toilet model was installed in 150 households in Shada II as part of a pilot study with re.source. To improve the lifespan of our toilets and reduce the maintenance cost, we developed various concrete toilet models reinforced with steel. They were made with a mold made from wood, and some had a side opening. It had a removable wooden top made from Haitian wood with a screwed plastic molded urinal and a seat. The toilet had no bottom. 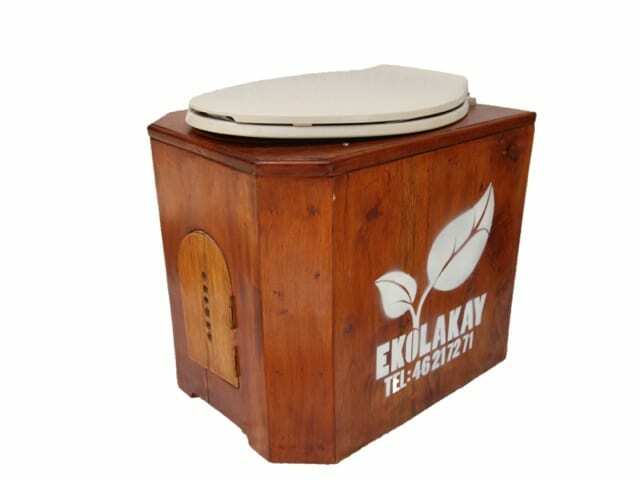 The most recent wooden EkoLakay toilet design is made by local carpenters out of plain Haitian wood. It has a wooden bottom lined with a plastic sheet to facilitate cleaning. It has a top loader for the pee gallon and poop bucket and a small front window to check the level of the pee gallon protected by a metallic screen. It’s topped off with a plastic seat. 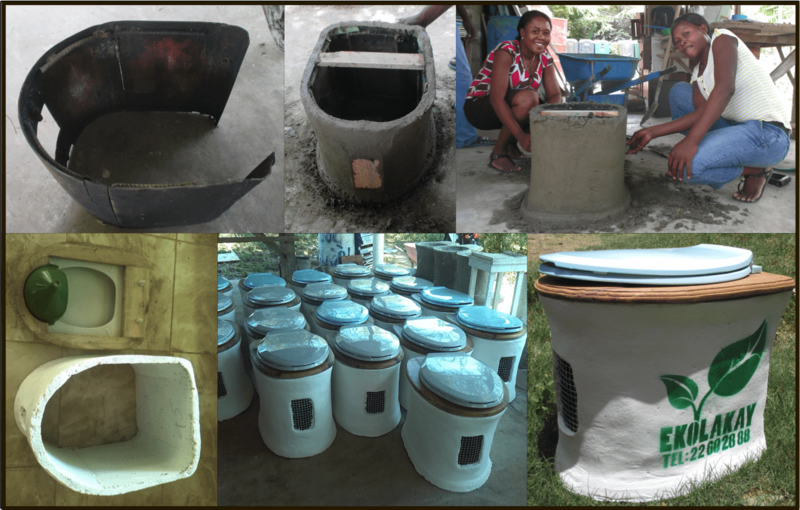 The ferro-cement EkoLakay toilet is our most cost-effective model yet. It’s a bottomless toilet made by local women contractors at our workshop out of cement reinforced with chicken wire and is lighter than the previous concrete toilet. It has a small opening in the front to check the level in the pee gallon. The opening has a chicken wire screen to prevent pests and flies from entering. The toilet is shaped by hand on a steel mold. The top is plain, but beautiful, Haitian wood and has a screwed-on plastic urinal (cut from a funnel) and a plastic toilet seat. The top is also removable. Bottomless, so easy to clean! 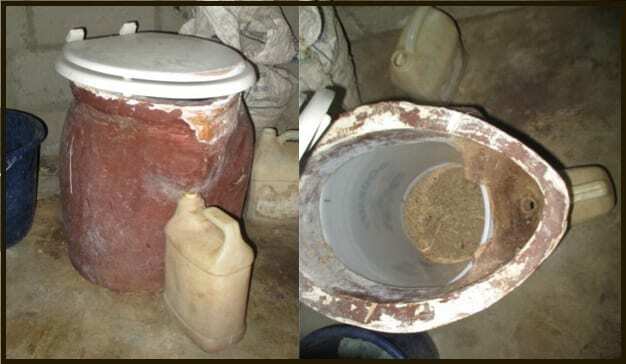 Urine diversion systems are not exactly the kind of product you can find easily or inexpensively in Haiti. Some companies produce them abroad, like the one we were using in our Artsy Wooden Box, for example, where the urinal is directly integrated into the seat. The one we used in the Artsy toilet was made locally out of fiberglass and the urinal was super durable and easy-to-use. The only drawback was the cost: $75! The seat plus urinal itself was expensive compared to our current costs to produce an entire new EkoLakay toilet, which is now between $35 and $50. Thus we continue to do serious R&D on a suitable alternative for producing, instead of purchasing, our very own UD systems. Following the Stanford pilot (see Shiny Formica re.source Toilet above), we tried to make our own homemade vacu-formed urinals using the same process as that of the re.source researchers: out of a plastic sheet using a kiln mold, an electric heater, and a vacuum. The urinals were made by molding a plastic sheet to a concrete or clay mold and then applying heat and pressure using an electric heater and a vacuum engine (see photo below). Sadly, the quality of the urinals produced varied a lot and they tended to break easily, especially the tip of the urinal. Additionally we could not find the plastic sheets that we needed in Haiti. Because of these challenges we discontinued production. We then partnered with a local professional school to make welded galvanized iron urinals. These were installed in approximately 200 toilets, sometimes replacing the broken plastic molded urinals. Sadly, after a while, we realized that the supposedly galvanized iron we were using was not truly galvanized. Because of the corrosive power of pee, these urinals started to be corroded at the welded junctions. Thus we had to find new innovative solutions. We found some plastic funnels, made in the Dominican Republic, that could be cut into nice urinals. The challenge with the funnel urinals is that, although they are easy to clean and durable, they do not fit perfectly in the toilet. Additionally as they are only made in the Dominican Republic, they can be hard to access in large quantities in Haiti. They cost about $3 USD per funnel. We are currently working in collaboration with re.source, frog design and Sanivation to design a plastic mold for urine diversion toilet seat which could be made in China and then imported to Haiti and Kenya for use by local plastic manufacturers. This would allow us to have a standardized plastic product that could be made locally and inexpensively. We’ll post about the outcomes of this collaboration over the coming posts, so keep you eye on the SOIL blog! Designing a new household toilet was not always as smooth of a process as our pretty timeline here might indicate. We have faced many challenges throughout the iterative design process, and our team came up with many innovative ways to address these challenges. Some of these innovations are still being used today, but many – include sliding front loaders for buckets and pee gallons, pivoting pee gallon loaders, external urinals, and more! – are now thankfully just distant memories! 16 Replies to "The long and eventful journey of the SOIL household toilet design"
Thank you for sharing your iterative design process. We continue to learn from you. Meanwhile hundreds of people in Haiti have toilets that are more elegant and sophisticated that the flush toilets we have in the US. By elegant I mean ingenious and simple. By sophisticated I mean state of the art, the new gold standard in sanitation – urine separation, composting and reuse. With the severe drought on the West Coast of North America, our communities are finally realizing the water waste of flush toilets. They are asking about alternatives. Some seem ready to do the work to design a system (household toilet + management/treatment/reuse) that meets the needs of a particular town or neighborhood and makes ecological and economic sense. I look forward to showing them the approach of your team at SOIL. Thank you for the inspiration! Thanks for the kind words, Carol! We are definitely excited about composting toilets gaining popularity in the US! What is your favorite cover material now? Did you ever try using the finished compost? Hi Chris, do you have any photos or details on toilets that function with the Coanda effect? To my knowledge, SOIL has never tried this – would be interesting to investigate! Right now our cover material is a mix of dried sugar cane waste and peanut shells. We mill those materials to a pretty fine consistency and then mix them 75% cane, 25% peanut shells. We are also conducting an experiment with adding ashes to mix as well. We have used compost, but it’s more cost-effective for us to sell it to help cover our waste treatment expenses, as we are able to obtain the other materials at a very low cost. I studied some bioconstruction methods at IPEC in Pirenópolis, Brazil, where I live. We learned to works and how to build dry toillets. André, one of the researchers of IPEC told us that they have built small compost toillets and they didn’t separate pee from poop. Inside the compost toilet recipient, where the pee and the poop goes, there is a natural organic filter but I don’t remember anymore how exactly it was made. I just remember that the recipient could last a long time before replacing and as byproduct they produce also some fertilizer. I was wondering why are you separating in this Ekolakay technology pee from poop? Congrats for all the work you are doing. I wish you all the best!! Thanks Barbara! We separate pee from poop because we’ve found the toilets are much easier to manage that way; non-separating toilets require a LOT more cover material to keep things dry so that you don’t have a problem with odor or flies. Because of that, buckets fill up much more quickly (and are heavier), which poses additional challenges for our collection team. We do use non-separating toilets for many of our EkoMobil (port-a-potty) rentals, which is helpful because you don’t have to worry about managing the pee gallon. Because EkoMobils are generally rented by businesses and organizations, we can price accordingly to cover our costs for the additional cover material and buckets. Thanks again for the kind words, and we’ll be sure to check out EcoCentro! 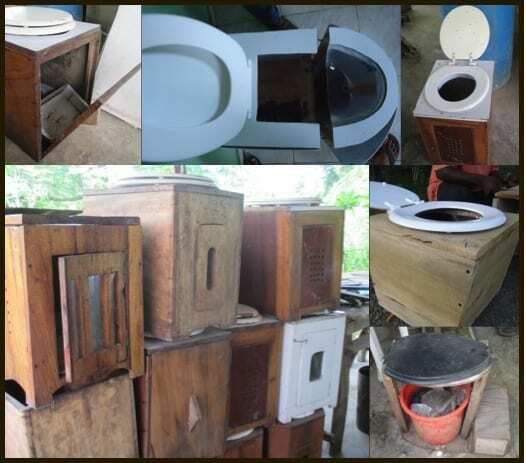 Please check this website to see this interesting type of compost toilet. At City of the Sun Foundation (a not-for-profit alternative community located near Columbus, NM) the first “composting” toilet I used was a 5 gallon bucket with sawdust. Everything went in – then when full, the contents were buried. Not a great thing. Some members now use Sun-Mar composting toilets with peat moss, bokashi, or EM (Effective Microorganisms) these have a tray at the bottom that is emptied once or twice a year – and the compost used on vegetation (not for human consumption). No odor. We also use EM in our environmentally approved wastewater lagoon – again, no odor and the EM works as a digestive element. Some individuals still compost in a bucket but now use EM and bokashi which digests the waste much better. Rose George wrote a book “The Big Necessity” which reviews waste management (and the lack of it) world wide. Sun-Mar or others like it would be too expensive for most people -bokashi is simple to make using EM and bran – and EM is economical when the concentrate is mixed (as I do for our legoon) 3/4C EM, 3/4C molasses (feed grade for cattle) to 1 gallon of water – (not chlorinated) – finding a solution that is manageable is laudable and you are to be congratulated on your efforts to resolve a serious world-wide problem that gets very little attention. I believe we can BUILD soil with our waste rather than polluting our streams and rivers (and oceans) – keep up the good work. Thank you. Great story! Do you have this information also in French? We don’t at this time, although we aspire to get our whole website translated into both French and Haitian Kreyol in the future. Best of luck! Congratulations for your fantastic work on UD Toilets in Haiti. I went to see one of them in Cap Haitian district in 2012. I am working on an assessment in floods prone areas in northern Ghana. The design of UD Toilets that we have proposed are far too expensive for the target rural communities (>250 USD). We are considering sustainale solutions with local capacities and materials, but can’t reach a low-cost solution at the moment, still on research. We propose raised latrines, with an earth mound which can withstand floods impact. Do you have some ideas? Thank you. Thanks for your kind words. have you checked out the SOIL Guide to EcoSan? If you go our our Resources section, you can download it for free. It may have some helpful ideas. Why don’t you start there, and then feel free to contact us if you have further questions! I am very concerned about using wood for the toilet bodies when Haiti has a severe deforestation problems. Also, overtime wood can rot in humidity. Have you considered a hard plastic material that is similar to the 5 gallon buckets you used for waste removal? Thanks for your comments! We are moving away from the wood toilets in favor of reinforced cement, but we’ve never tried a hard plastic. I’ll pass this suggestion to our technical committee. Quick question: What do you do with the pee gallons when they’re filled? I’ve noticed that you use the contents of the poop bucket for fertilizer. Does the pee go in for fertilizer separately? Thanks for the great question, Josie! While the buckets of poop and bonzodé carbon cover material are brought to our composting sites weekly and transformed into nutritious compost, we don’t collect the urine. Families dispose of their urine at their discretion, generally either in a collective pour-away spot that we install in the communities where we work or as fertilizer for their gardens. The public health risk of urine is negligible and while we’d love to be able to do something with the pee – which can be incredibly valuable – it’s quite heavy and as transportation costs are our biggest expense, it is not feasible for us to collect at this time.